Discovered today that you can easily use a 3D camera track in Nuke to stabilize a plate – and what’s more, you can easily choose which plane of the image you want to lock down (something in the foreground, mid-ground or background). Get a good 3D camera track, masking out anything that moves first. Solve the camera and go to a frame you’d like to use for reference, probably somewhere in the middle of the sequence. Copy and paste the camera, renaming them to something like ‘CameraMain’ and ‘CameraProject’. Create a Project3D node and connect it to CameraProject. Also plug the plate into the Project3D. While viewing the plate, bring up the CameraTracker properties pane so that you can see the solved camera tracks over the plate. Choose one that sits on the plane you want to stabilize, eg on the back wall. Then right-click the point and choose ‘create – card ‘ to create a card in 3D space at that coordinate. Plug the Project3D into the card. Switch to 3D view and you should see the image projected from CameraProject onto the card. Remove all rotation from the card in the properties pane so that it’s flat on to CameraMain, then use the Uniform Scale on the card to scale it up nice and large so that none of the picture gets cut off. 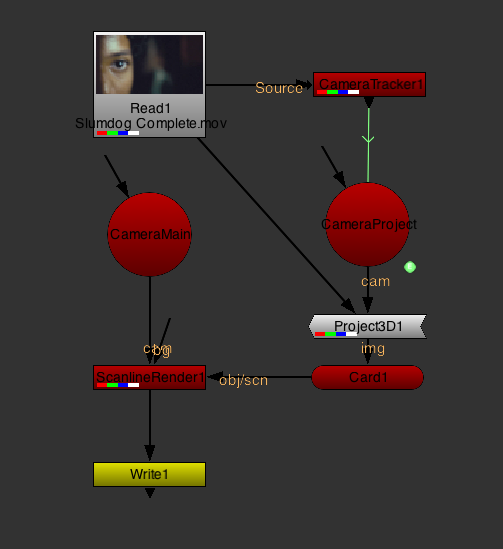 Now, create a ScanlineRender, plug in the card and CameraMain (your stationary camera), then view the result. If you are still on the same reference frame, the output should be identical to the plate. Play it back and you should see a stabilized image. You will then need to crop the image to remove black edges appearing. To choose a different plane to lock to, just repeat steps 6-8 using a different point from the track (eg, something from the foreground). You can do this several times and keep the cards in your script, swapping them out to find which one gives the best result. Alternatively you can just play with the Z translation of the first card until you get what you want, but choosing an actual point on a plane will probably be quicker. So, to summarize, the viewing camera and the card do not move at all, but the image being projected moves around on the card, which matches the camera move in the shot, cancelling out the movement. EDIT: After using this technique quite a lot for various tasks, I realise that for best results you should create a card at the angle of the plane you want to stabilise (by selecting multiple points on that plane and creating a card), rather than pick one point and remove rotation. That’s what you’d do for a frame hold patch projection, so you’d do the same here. Only difference is you swap the cameras. This means after you stabilise, you can copy the card and project it onto the new card with the cameras swapped to match move it back to the original. Useful for creating mattes, but not advised for patches because of the slight softness produced as it breaks concatenation between the two stages. I’ve been using it recently to create rain mattes; remove the camera movement using the 3D track, Min 3 adjacent frames together to remove the bright rain drops, use a Difference node between the stablised plate and the Min, then match move using the same camera setup. Gives a nice alpha of the rain as that’s the only thing moving in the plate.